Having had such a successful prize draw and not so bad winter weather our hopes were high for a less stressful winter than previous years, however it did not last and whilst others were ringing in the new year we were on high alert. Anyone who knows anything about horses will know that strangles is one of the most feared illnesses due to how contagious it is, the fact that a horse can be carrying it without showing the typical signs and the suffering it inflicts on its victims. 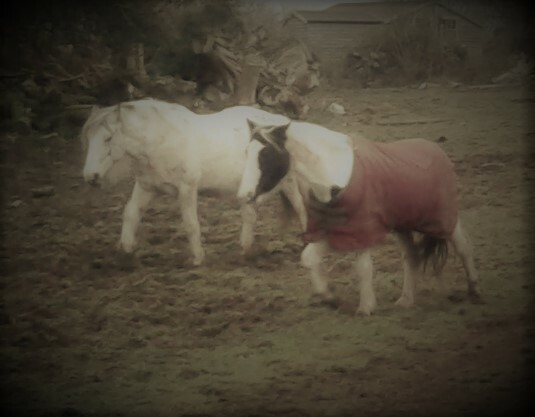 The real heartache started on the 20th of January, when despite Frankie & Milly having been in an enclosure on their own away from the other horses from the minute they arrived at the rescue, two of our shetlands (Mia & Harry) presented with strangles symptoms. 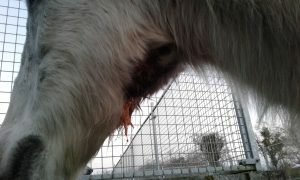 First thing the following morning we had to put in a call to the vet as they were both having breathing issues … the vet started them on antibiotics & anti-inflammatories and also had a look at Patsy who was also showing signs of swelling on her face. 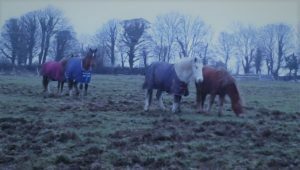 We chatted with the vet about the best course of action as it was obvious that the infection was going to be widespread now in the herd and so it was simply a case of treat each one as they developed symptoms. 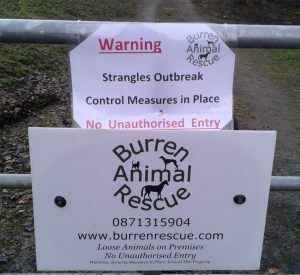 Signs were made up for all our roadside gates informing people of the strangles outbreak and we notified all our neighbours with horses. 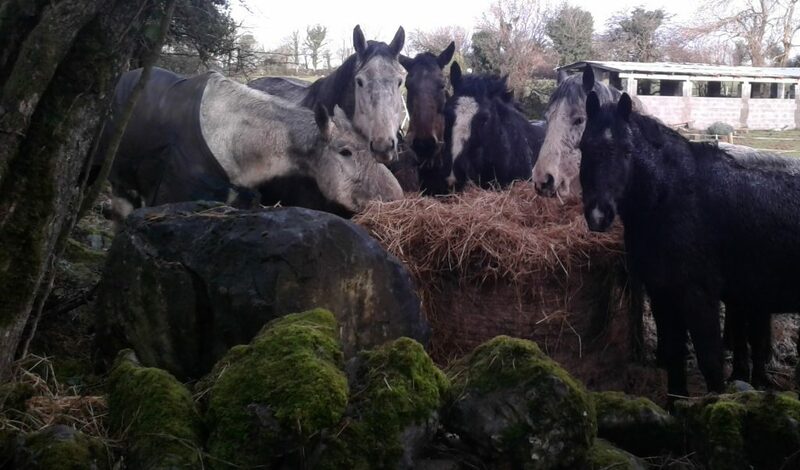 Extra bags of ration and chaff were bought so that we had sufficient substitute feed at the ready for any of the gang who had difficulty eating hay due to glandular swellings. Apple cider vinegar was added to the feed together with garlic, honey & glucose to help boost their immune systems. There was nothing more we could do to stop this horrible infection and there was nothing anyone could do for us. We did hope for a while that it was only ‘the farts’ that were infected but last week the first of the donkeys and first of the big horses started showing signs of weight loss & discomfort so we knew the swollen glands and discharge was not far away for them. Five weeks into the first appearance of strangles, those that are recovering have lots of weight to put on, those that are still in the depths of the infection continue to be treated with medication and then we still have a few that have not developed it. It has been traumatic to see the pain and suffering, especially in the ones that we fought hard to get healthy when they first arrived. There are two or three that it has hit very hard whom we are keeping our fingers tightly crossed for. Obviously, as is best practice, we will be maintaining our closed gates policy until 3 weeks after all the equines & donkeys have recovered. We apologise to those people who wanted to come to see the horses in the past few weeks that we had to say no to but we will not risk the infection being brought out to other horses. We have continued responding to cruelty/abandonment calls and in one case we were lucky one of our neighbours took in a needy yearling donkey for us. The only one of our equines who is available to rehome straight away is Harry the cob as luckily he has been in foster with Louise since the summer. All the tack, etc that we have for sale is also with Louise (who has not been to the rescue since well before the two ponies which brought in the infection arrived) so there is no need for anyone to worry about buying anything from our ‘tack shop‘ … in fact we will be heavily relying on people supporting the tack shop now as obviously we have an ever rising vet bill to contend with due to the strangles outbreak. 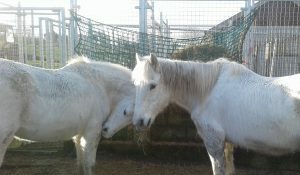 Please be assured we are doing all we can to support the horses and donkeys in our care.